The National Diet is the legislature, the organ of the Legislative branch. It is bicameral, consisting of two houses with the House of Councilors being the upper house, and the House of Representatives being the lower house. Its members are directly elected from the people, who are the source of sovereignty. The Supreme Court and other inferior courts make up the Judicial branch, and they are independent from the executive and the legislative branches. Prior to the Meiji Restoration, Japan was ruled by successive military shoguns. During this period, effective power of the government resided in the Shogun, who officially ruled the country in the name of the Emperor. The Shoguns were the hereditary military governors, with their modern rank equivalent to a generalissimo. Although the Emperor was the sovereign who appointed the Shogun, his roles were ceremonial and he took no part in governing the country. This is often compared to the present role of the Emperor, whose official role is to appoint the Prime Minister. The Meiji Restoration in 1868 led to the resignation of Shogun Tokugawa Yoshinobu, agreeing to "be the instrument for carrying out" the Emperor's orders. This event restored the country to Imperial rule and the proclamation of the Empire of Japan. In 1889, the Meiji Constitution was adopted in a move to strengthen Japan to the level of western nations, resulting in the first parliamentary system in Asia. It provided a form of mixed constitutional-absolute monarchy, with an independent judiciary, based on the Prussian model of the time. A new aristocracy known as the Kazoku was established. It merged the ancient court nobility of the Heian period, the Kuge, and the former Daimyo, feudal lords subordinate to the Shogun. It also established the Imperial Diet, consisting of the House of Representatives and the House of Peers. Members of the House of Peers were made up of the Imperial Family, the Kazoku, and those nominated by the Emperor, while members of the House of Representatives were elected by direct male suffrage. Despite clear distinctions between powers of the executive branch and the Emperor in the Meiji Constitution, ambiguity and contradictions in the Constitution eventually led to a political crisis. It also devalued the notion of civilian control over the military, which meant that the military could develop and exercise a great influence on politics. 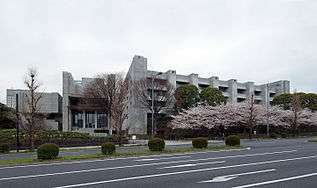 The House of Representatives of Japan (衆議院) is the Lower house, with the members of the house being elected once every four years, or when dissolved, for a four-year term. As of December 24, 2014, it has 475 members. Of these, 180 members are elected from 11 multi-member constituencies by a party-list system of proportional representation, and 295 are elected from single-member constituencies. 238 seats are required for majority. The House of Representatives is the more powerful house out of the two, it is able to override vetoes on bills imposed by the House of Councillors with a two-thirds majority. It can, however, be dissolved by the Prime Minister at will. Members of the house must be of Japanese nationality; those aged 18 years and older may vote, while those aged 25 years and older may run for office in the lower house. 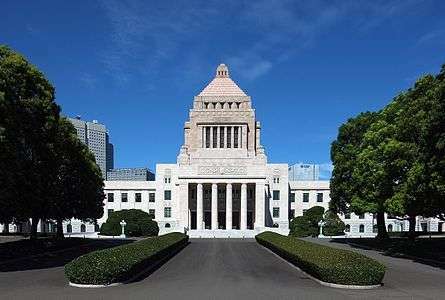 The House of Councillors of Japan (参議院) is the Upper house, with half the members of the house being elected once every three years, for a six-year term. As of December 24, 2014, it has 242 members. Of these, 73 are elected from the 47 prefectural districts, by single non-transferable votes, and 48 are elected from a nationwide list by proportional representation with open lists. The House of Councillors cannot be dissolved by the Prime Minister. 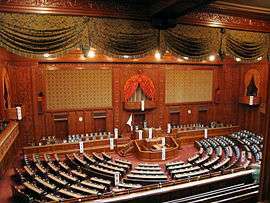 Members of the house must be of Japanese nationality; those aged 18 years and older may vote, while those aged 30 years and older may run for office in the upper house. 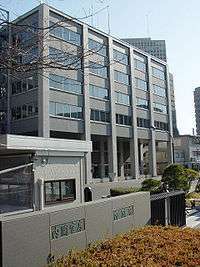 The Judicial branch of Japan consist of the Supreme Court, and four other lower courts; the High Courts, District Courts, Family Courts and Summary Courts. Divided into four basic tiers, the Court's independence from the executive and legislative branches are guaranteed by the Constitution, and is stated as: "no extraordinary tribunal shall be established, nor shall any organ or agency of the Executive be given final judicial power"; a feature known as the Separation of Powers. Article 76 of the Constitution states that all the Court judges are independent in the exercise of their own conscience and that they are only bounded by the Constitution and the laws. Court judges are removable only by public impeachment, and can only be removed, without impeachment, when they are judicially declared mentally or physically incompetent to perform their duties. The Constitution also explicitly denies any power for executive organs or agencies to administer disciplinary actions against judges. 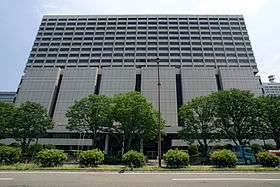 However, a Supreme Court judge may be dismissed by a majority in a referendum; of which, must occur during the first general election of the National Diet's House of Representatives following the judge's appointment, and also the first general election for every ten years lapse thereafter. Trials must be conducted, with judgment declared, publicly, unless the Court "unanimously determines publicity to be dangerous to public order or morals"; with the exception for trials of political offenses, offenses involving the press, and cases wherein the rights of people as guaranteed by the Constitution, which cannot be deemed and conducted privately. Court judges are appointed by the Cabinet, in attestation of the Emperor, while the Chief Justice is appointed by the Emperor, after being nominated by the Cabinet; which in practice, known to be under the recommendation of the former Chief Justice. ↑ "The World Factbook Japan". Central Intelligence Agency. Retrieved 5 September 2015. ↑ Article 4(1) of the Constitution of Japan Section 1, Constitution of Japan (1947; in English). Retrieved on 5 September 2015. 1 2 Article 65 of the Constitution of Japan Section 5, Constitution of Japan (1947; in English). Retrieved on 5 September 2015. 1 2 3 Article 68(1) of the Constitution of Japan Section 5, Constitution of Japan (1947; in English). Retrieved on 5 September 2015. 1 2 Article 67(1) of the Constitution of Japan Section 5, Constitution of Japan (1947; in English). Retrieved on 5 September 2015. 1 2 Article 6(1) of the Constitution of Japan Section 1, Constitution of Japan (1947; in English). Retrieved on 5 September 2015. 1 2 3 Article 1 of the Constitution of Japan Section 1, Constitution of Japan (1947; in English). Retrieved on 5 September 2015. 1 2 Article 76(2) of the Constitution of Japan Section 6, Constitution of Japan (1947; in English). Retrieved on 5 September 2015. ↑ Chaurasla, Radhey Shyam (2003). History of Japan. New Delhi: Atlantic Publishers and Distributors. p. 10. ISBN 9788126902286. ↑ Satow, Ernest Mason (Aug 23, 2013). A Diplomat in Japan. Project Gutenberg. p. 282. Retrieved 5 September 2015. ↑ "Asia's First Parliament". The New York Times. Retrieved 5 September 2015. ↑ "The Nature of Sovereignty in Japan, 1870s–1920s" (PDF). University of Colorado Boulder. Retrieved 5 September 2015. ↑ Lebra, Takie Sugiyama (1992). Japanese social organization (1 ed.). Honolulu: University of Hawaii Press. p. 51. ISBN 9780824814205. ↑ Article 34 of the Constitution of the Empire of Japan Section 3, Constitution of the Empire of Japan (1889; in Japanese). Retrieved on 5 September 2015. ↑ Article 35 of the Constitution of the Empire of Japan Section 3, Constitution of the Empire of Japan (1889; in Japanese). Retrieved on 5 September 2015. ↑ Skya, Walter A. (2009). Japan's holy war the ideology of radical Shintō ultranationalism. Durham: Duke University Press. p. 40. ISBN 9780822392460. ↑ Martin, Bernd (2006). Japan and Germany in the modern world (1. paperback ed.). New York [u.a. ]: Berghahn Books. p. 31. ISBN 9781845450472. ↑ "The Constitution: Context and History" (PDF). Hart Publishing. Retrieved 5 September 2015. ↑ Article 4 of the Constitution of Japan Section 1, Constitution of Japan (1947; in English). Retrieved on 5 September 2015. ↑ "Did the Emperor of Japan really fall from being a ruler to a symbol" (PDF). Tsuneyasu Takeda. Instructor, Keio University. Retrieved 28 August 2015. ↑ "2009 Japanese Emperor and Empress Visited in Vancouver". Retrieved 18 June 2015. ↑ "A shadow of a shogun". The Economist. Retrieved 18 June 2015. 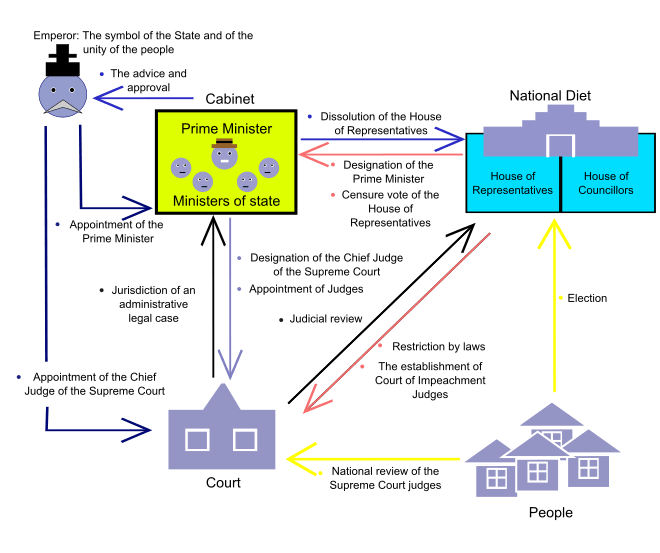 ↑ "Fundamental Structure of the Government of Japan". Prime Minister's Official Residence Website. Retrieved 1 September 2015. ↑ Article 5 of the Constitution of Japan Section 1, Constitution of Japan (1947; in English). Retrieved on 5 September 2015. ↑ "Japan's royal family pose for unusual New Year photo". The Daily Telegraph. Retrieved 18 June 2015. ↑ Kitagawa, Joseph M. (1987). On understanding Japanese religion. Princeton, N.J.: Princeton University Press. p. 145. ISBN 9780691102290. ↑ Smith, Robert J. (1974). Ancestor worship in contemporary Japan ([Repr.]. ed.). Stanford, Calif.: Stanford University Press. pp. 8–9. ISBN 9780804708739. 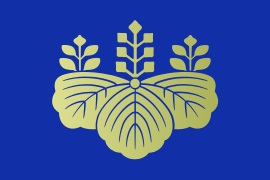 ↑ "Kojiki". Ō no Yasumaro. Retrieved 5 September 2015. ↑ "Nihon Shoki" (PDF). Prince Toneri. Retrieved 5 September 2015. ↑ "Enthronement and Ceremonies". Imperial Household Agency. Retrieved 1 September 2015. ↑ "The 20th Anniversary of His Majesty the Emperor's Accession to the Throne". Ministry of Foreign Affairs. Retrieved 1 September 2015. ↑ Article 69 of the Constitution of Japan Section 5, Constitution of Japan (1947; in English). Retrieved on 5 September 2015. ↑ Article 72 of the Constitution of Japan Section 5, Constitution of Japan (1947; in English). Retrieved on 5 September 2015. 1 2 3 Article 7 of the Constitution of Japan Section 1, Constitution of Japan (1947; in English). Retrieved on 5 September 2015. 1 2 Article 67(2) of the Constitution of Japan Section 5, Constitution of Japan (1947; in English). Retrieved on 5 September 2015. 1 2 Article 63 of the Constitution of Japan Section 4, Constitution of Japan (1947; in English). Retrieved on 5 September 2015. 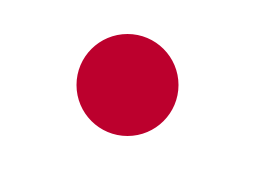 ↑ Article 66(2) of the Constitution of Japan Section 5, Constitution of Japan (1947; in English). Retrieved on 5 September 2015. ↑ "内閣法". Government of Japan. Retrieved 1 September 2015. ↑ "Toshiaki Endo appointed Olympics minister". The Japan Times. Retrieved 1 September 2015. ↑ Article 68 of the Constitution of Japan Section 5, Constitution of Japan (1947; in English). Retrieved on 5 September 2015. ↑ Article 68(2) of the Constitution of Japan Section 5, Constitution of Japan (1947; in English). Retrieved on 5 September 2015. ↑ Article 75 of the Constitution of Japan Constitution of Japan (1947; in English). Retrieved on 5 September 2015. ↑ "第３次安倍内閣 閣僚等名簿". Prime Minister's Official Residence Website. Retrieved 7 October 2015. ↑ "CABINET PROFILES". The Japan Times. Retrieved 7 October 2015. ↑ "Bureaucrats of Japan". Library of Congress Country Studies. Retrieved 1 September 2015. ↑ "Links to Ministries and Other Organizations". Prime Minister's Official Residence Website. Retrieved 7 October 2015. ↑ "Ministries and Agencies". Government of Japan Website. Retrieved 7 October 2015. ↑ "Board of Audit of Japan". Board of Audit. Retrieved 5 September 2015. ↑ Article 43(1) of the Constitution of Japan Section 4, Constitution of Japan (1947; in English). Retrieved on 5 September 2015. ↑ Article 96 of the Constitution of Japan Section 9, Constitution of Japan (1947; in English). Retrieved on 5 September 2015. ↑ Article 64(1) of the Constitution of Japan Section 4, Constitution of Japan (1947; in English). Retrieved on 5 September 2015. 1 2 3 "Diet enacts law lowering voting age to 18 from 20". The Japan Times. Retrieved 18 June 2015. ↑ Article 56(1) of the Constitution of Japan Section 4, Constitution of Japan (1947; in English). Retrieved on 5 September 2015. ↑ Article 55 of the Constitution of Japan Section 4, Constitution of Japan (1947; in English). Retrieved on 5 September 2015. ↑ Article 53 of the Constitution of Japan Section 4, Constitution of Japan (1947; in English). Retrieved on 5 September 2015. 1 2 Article 54(2) of the Constitution of Japan Section 4, Constitution of Japan (1947; in English). Retrieved on 5 September 2015. ↑ Article 45 of the Constitution of Japan Section 4, Constitution of Japan (1947; in English). Retrieved on 5 September 2015. 1 2 "解散と万歳". Democratic Party of Japan. Retrieved 1 September 2015. ↑ "小泉進次郎氏、衆議院解散でも万歳しなかった「なぜ今、解散か」". The Huffington Post. Retrieved 1 September 2015. ↑ "開会式". House of Councillors. Retrieved 1 September 2015. 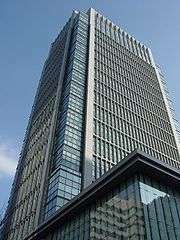 ↑ "Overview of the Judicial System in Japan". Supreme Court of Japan. Retrieved 18 June 2015. ↑ Article 76 of the Constitution of Japan Section 6, Constitution of Japan (1947; in English). Retrieved on 5 September 2015. 1 2 Article 78 of the Constitution of Japan Section 6, Constitution of Japan (1947; in English). Retrieved on 5 September 2015. ↑ Article 79(2) of the Constitution of Japan Section 6, Constitution of Japan (1947; in English). Retrieved on 5 September 2015. ↑ Article 82(2) of the Constitution of Japan Section 6, Constitution of Japan (1947; in English). Retrieved on 5 September 2015. ↑ "Change at the top court's helm". The Japan Times. Retrieved 18 June 2015. ↑ Dean, Meryll (2002). Japanese legal system : text, cases & materials (2nd ed.). London: Cavendish. pp. 55–58. ISBN 9781859416730. 1 2 "Japanese Civil Code". Encyclopædia Britannica. Retrieved 18 June 2015. ↑ "MacArthur and the American Occupation of Japan". Retrieved 18 June 2015. ↑ Article 74 of the Constitution of Japan Section 5, Constitution of Japan (1947; in English). Retrieved on 5 September 2015. ↑ Article 7(1) of the Constitution of Japan Section 1, Constitution of Japan (1947; in English). Retrieved on 5 September 2015. ↑ "II. The law-making process". Cabinet Legislation Bureau. Retrieved 6 September 2015. ↑ "The Privy Seal and State Seal". Imperial Household Agency. Retrieved 6 September 2015. ↑ "Promulgation of Laws". National Printing Bureau. Retrieved 6 September 2015. ↑ Article 81 of the Constitution of Japan Section 6, Constitution of Japan (1947; in English). Retrieved on 5 September 2015. 1 2 "Overview of the Judicial System in Japan". Supreme Court of Japan. Retrieved 6 September 2015. ↑ "Correction Bureau". Ministry of Justice. Retrieved 6 September 2015. ↑ "Rehabilitation Bureau". Ministry of Justice. Retrieved 6 September 2015. 1 2 3 4 5 三割自治 "Local Government". Retrieved 18 June 2015. ↑ Article 92, 93, 94 and 95 of the Constitution of Japan Section 8, Constitution of Japan (1947; in English). Retrieved on 5 September 2015. 1 2 "AUTHORITY OF THE NATIONAL AND LOCAL GOVERNMENTS UNDER THE CONSTITUTION". Duke University School of Law. Retrieved 6 September 2015. 1 2 "Local Autonomy Law". Government of Japan. Retrieved 6 September 2015. ↑ "The Large City System of Japan" (PDF). National Graduate Institute for Policy Studies. Retrieved 6 September 2015. ↑ Article 93(2) of the Constitution of Japan Section 8, Constitution of Japan (1947; in English). Retrieved on 5 September 2015. 1 2 "Local Autonomy in Japan Current Situation & Future Shape" (PDF). Council of Local Authorities for International Relations. Retrieved 6 September 2015. ↑ "An Outline of Local Government in Japan" (PDF). Council of Local Authorities for International Relations. Retrieved 6 September 2015. ↑ "The Organization of Local Government Administration in Japan" (PDF). National Graduate Institute for Policy Studies. Retrieved 6 September 2015.